Are you planning a gift of jewelry? Whether it's for yourself or for someone you love, build in time to get a good background on the subject. Learning more about jewelry is a fascinating subject even if you're not in the market right now and the more you know, the happier you'll be when it comes time to make a big purchase. A gift of jewelry can be very expensive. A diamond engagement ring, for instance, can be one of the biggest purchases you've ever made. If you're not familiar with a jeweler in your area, ask family members, friends or co-workers for recommendations. Before you buy from a local jeweler, check prices online to find out what range is normal for the piece you're looking at. If you decide to order online, check on the reputation of the store with the Better Business Bureau or your local attorney general's office. If you're auction shopping for jewelry, get familiar with the safeguards to know before you by at an online auction. The more research you do before you make the purchase, the happier you'll be afterwards. Ask your salesperson to write down any information about the jewelry. Any assurances that are not in writing are open to question. Honestly, you may misinterpret what is being said. If you see it in writing you'll be clearer and you also have documentation to back you up if there is a problem later. Before you buy...ask for the store's refund and return policy. Ordering online? Keep printouts of the web pages and any receipts - including email messages - anything that has details about the transaction, including prices, refund information and return policies. If you're not satisfied, you'll need all of these to return your purchase. If you save these on your computer - make a backup copy on a disk! This is one stone that you should always make sure to purchase from a jeweler you trust. Even then, getting a certificate and having the stone appraised by another jeweler is a good idea. When you're searching for facts and information on buying a diamond, look for the famous 4 C's: cut, color, clarity and carats (weight). Each of these will affect the price. Color is sometimes "graded" on a scale, but not every scale is identical. A "D" may be the best color for one scale, but not for another. Make sure you know how a particular scale and grade represents the color of the diamond you're considering. A diamond can be described as "flawless" only if it has no visible surface cracks or other imperfections when viewed under 10-power magnification by a skilled diamond grader. The quest for gold is not limited to sports heroes. Nations have been built by explorers in search of the precious yellow metal and wars have been fought to increase a country's supply. The history of gold as a valuable metal goes back to before the Bible and the urge to collect and possess it is still strong today. The most common mixture of gold used in jewelry, fourteen karat (14K) gold, contains 14 parts of gold mixed with 10 parts of base metals. While 14K is standard for gold jewelry products, you can get anywhere from 10K to almost pure gold. Pure gold is not used for jewelry because it is too soft and will not keep it's shape well over time. Many items today are plated with gold instead of being solid gold. While gold-plated jewelry is very pretty, and often difficult to tell from the solid gold pieces, there's a big difference between gold and gold-plated jewelry. Technically, gold-plated describes jewelry with a layer of at least 10K gold bonded to a base metal. The plating can be a more expensive 14K or more and that usually determines the price of the piece. Even the best gold plating eventually wears away. How long the piece will last depends on how often the item is worn and how thick the plating is. 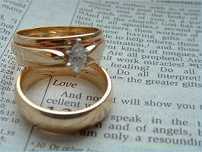 Advice from a jeweler on buying wedding rings: make sure that the rings are made from a solid bar. Some less expensive rings are solid gold, but assembled from pieces. These rings will not last as long as bands created from one solid piece! For those who are allergic to gold, you might be interested to know that the most common allergy is to molybdenum, one of the metals used to strengthen the gold. Often, getting a piece of jewelry that is 18 karats or higher will eliminate the allergic reaction! Know the difference between laboratory-created gemstones and naturally mined stones. Since stones created in the lab look exactly like stones mined from the earth this can be tricky. The big difference is the cost. Man made gems are less expensive to make than stones created by Mother Nature. Jewelers are required to identify lab-created stones. If you don't know your jeweler personally, ask to see the documentation. If you are buying a naturally mined stone, make sure to ask if it has been treated. Heating, dyeing or bleaching can improve a stone's appearance or may help it to last longer. Some treatments are permanent. Others may change the stone so that it requires special care. You'll need to know the care your stones require to keep them looking great and to maintain their value. You'll also want to know about any treatments because they may affect the stone's resale value. A cultured South Sea pearl. Before cultured pearls came on the scene in the early 1900s, natural pearls from oysters were the only ones available. A pearl is formed when a piece of sand or stone gets into an oyster's shell. It irritates the little creature who coats the offending grit with the same shiny substance as its shell. Because they were both rare and difficult to harvest, for centuries pearls were one of the most expensive forms of jewelry and were worn only by the rich and the nobility. Today's cultured pearls are still made by oysters, but with human intervention. Instead of waiting for grit to deposit itself into the shell, an irritant is put into the shells and this causes a pearl to grow. These oysters are "farmed" in "oyster beds" which makes harvesting them easier. Today, real pearls are fairly rare and still very expensive. The cost of cultured or natural pearls depends on the size, usually stated in millimeters, and the coating or "nacre" on a real pearl, which gives it its iridescence and color.